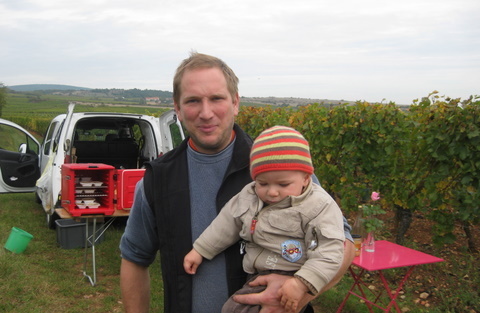 It’s been a tricky year for Alsace wine growers, confirms Jean-Paul Zusslin of Domaine Zusslin in Orschwihr – drought in winter and spring, bitter cold alternating with deluging rain, heatwaves and more monsoon rains. Growing grapes and making wine is a challenge at the best of times, in the best of years; this year’s been an especial challenge, all over France (and not only…). It’s a reminder that this particular branch of agriculture is as demanding and unpredictable as any. The big difference is that wine makers are a lot more cheerful than any farmer I’ve ever met. We join a cheery team of grape-pickers chez Zusslin, many of them from surrounding villages and a few from farther afield, young mums, retired teachers, old hands and first-timers (like us). First we pick Riesling, on the slopes of the Bollenberg vineyard above the village. Mildew has been a nightmare this year and there’s plenty of rot around – and not the good sort. It’s been a race to get the grapes to the optimal degree of ripeness in time to pick before the next wave of rain washes through. 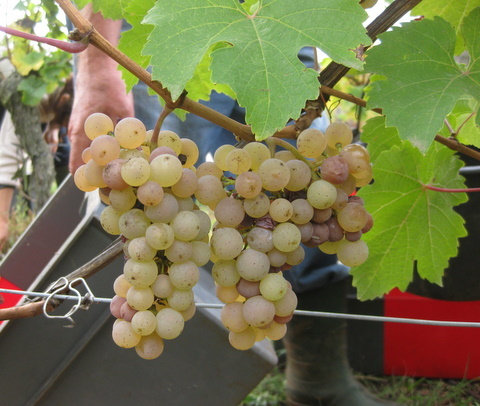 Sorting starts in the vineyard: the good grapes (luminous, almost transparent gold), destined for better cuvées, go into small crates. 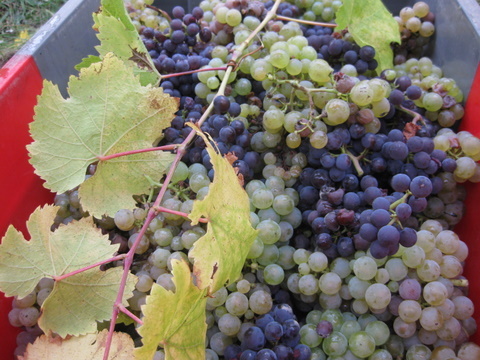 The unripe and damaged ones (firm and green and/or mouldy) go into buckets and will end up in an Edelzwicker blend. We break for lunch and are joined by other members of the Zusslin family, young and old, at trestle tables set up in the vineyards. Organic sausages in spicy tomato sauce and a puree of potatoes and carrots are washed down with Zusslin Crémant and Riesling from the Bollenberg. “You have to taste the wine from the vineyard where you’ve been picking”, smiles Marie Zusslin, who runs the domaine together with her brother Jean-Paul – with continued input from their parents, who are far from retired. 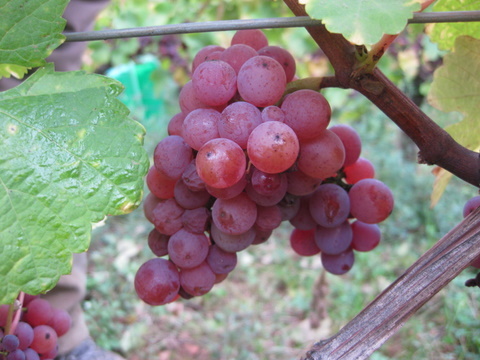 After lunch it’s the turn of Gewurz – as we snip away at the bunches we marvel at the luscious pinkish-purple hue of the ripe fruit. Back at the winery down in the village we watch as plastic crates of ‘our’ grapes are delivered by tractor and trailer. The contents are tipped onto the moving belt which conveys them up into the press. 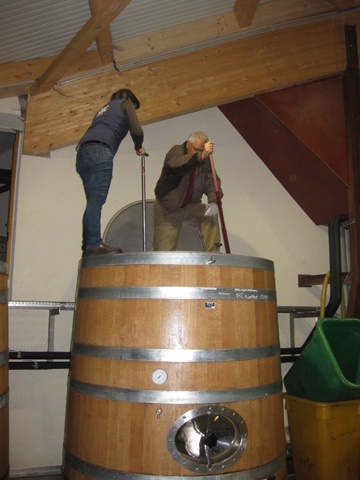 After about 8 hours of gentle pressing, the juice will be drawn off and moved to stainless steel tanks or wooden vats. From the cellar comes a comforting chorus of burblings and burps from tanks and barrels of gently fermenting must. 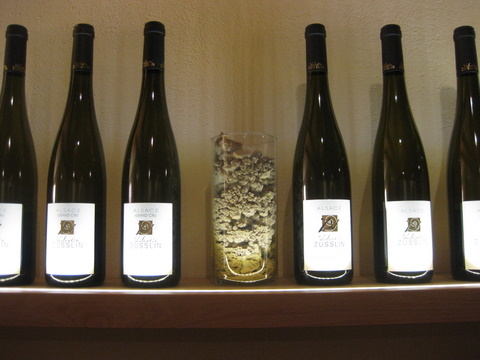 Domaine Zusslin wines are both organic and biodynamic, a philosophy that fits both Jean-Paul and Marie like a glove. They’re not messianic about it, just comfortable with the idea of working with nature rather than against it, and their wines seem to go from strength to strength, gaining in depth and complexity year by year. My own favourites include an old-vine Sylvaner, an unsulphured Pinot Auxerrois (deep golden, crisp, crunchy fruit, and – unlike many unsulphured wines, without a trace of oxidation), a fruity but dry Pinot Gris Cuvée Jean-Paul, Muscat Cuvée Marie (gorgeous for spring), and Pinot Noir Harmonie, a cuvée from selected grapes from the Bollenberg. Find them in top restaurants and at wine merchants in France, Switzerland, the US and the UK. Sounds great. Although I’ve been in the Orschwihr area, I’ve never heard of the producer, nor have I seen them in the US> I’ll have to do a search for their importer. Thanks, Sue. I found out that Mise Inc in Massachusetts either imports or distributes their wines (or both), and will be contacting them. And if I don’t hear back, I’ll contact Marie. I just heard from Mise Inc, and their wines are carried by several stores in Massachusetts that I shop at. They are expecting 5 of the Zusslin wines next week. Thanks for the info.